Kirbys Roofing specialises in the flexible yet highly durable EPDM Rubber Roofing System, made by Rubberbond. 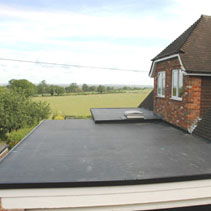 This is the most durable flat roofing system currently available. The system we use for all of our flat roofing installations is weather resistant, flexible and has a life expectancy of 50 years. 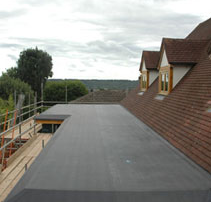 The Rubber Roofing System is one of the toughest materials known for resistance to weather wind and sun. It is a rubber roofing system that is designed and proven to outlast conventional flat roofing materials. 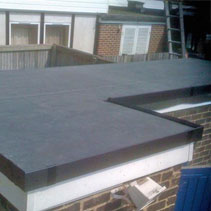 The RubberBond FleeceBack EPDM flat roofing system is also perfect for using below a terraced area or green roof system. 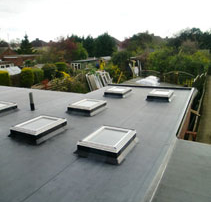 The outstanding strength and longevity of the FleeceBack roofing membrane is suitable for all types of green roof system and can also be tiled, slabbed or decked. 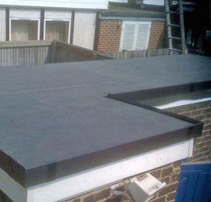 For areas that need maintenance access, Pressure Sensitive Walkway pads are available to provide a hardy, non slip surface for maintenance staff on the roof.